My reader may have noticed that I am lending my very modest support to Jeremy Corbyn in his bid to lead The Labour Party. 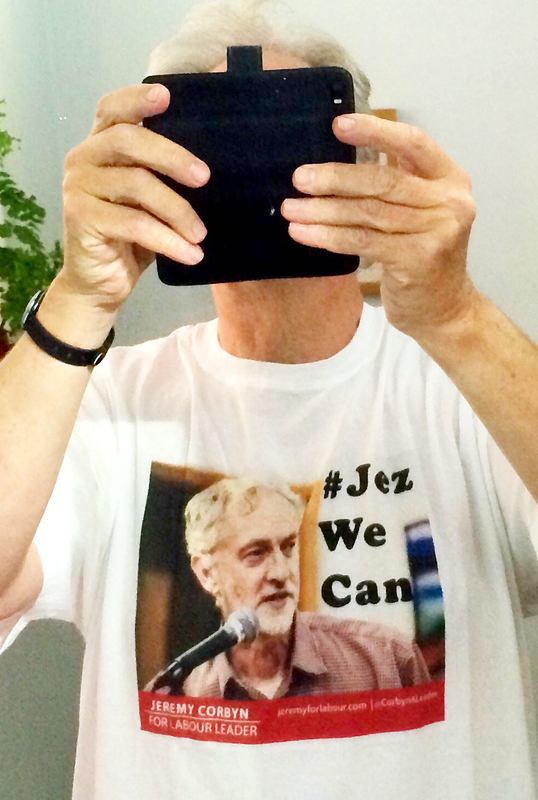 In fact, I have joined the party – as opposed to paying £3 to vote – in order to carry on supporting him, if he wins. Some of those who know me have expressed incredulity at my actions, while others have gone so far as to call me naïve and/or a Communist! For me, politics has always been a dynamic phenomenon – more where tomorrow will lead, than how to fix today. When I was attracted to the Young Liberals in the mid-60s, political reform was at the heart of my persuasion; a conviction that our so-called democratic institutions could no longer be trusted to produce democratic decisions. Since then the polarisation of party politics and the likes of David Steel, Paddy Ashdown & Charles Kennedy more-or-less have kept me in the Lib Dem corner. I was overjoyed at their forming part of The Coalition; which, I believe, history will look on more kindly than the electorate did this year. (If you think they were patsies, just look at what the first couple of months of Tory government have brought us!). I was however greatly dismayed at the liver-lillied campaign that the LibDems put up during the Coalition referendum on political reform. It felt like a betrayal and though I did in the end cast my vote again for the Yellow Team, the 2015 General Election was the first one in my political life that I did not canvas, drop leaflets or tell for any party. Strangely, having moved to North Islington in 2011, I did not cast my ballot for Jeremy Corbyn! Can’t really explain this. I did attend the local hustings and was mightily impressed by him but old habits die hard. I had expected the LibDems to fair extremely badly but nothing prepared me for the annihilation that came down. It seemed that both they and I had been cast into the political wilderness and that it was a life sentence. And not just for the LibDems and myself, it seemed that the country was also condemned to an eternity of spin-doctored politics whereby politicians are more concerned with what will get them elected than policies and principles that they you can count on them supporting. In early-July, I responded to a ‘support Jeremy Corbyn’ Facebook posting by my brother-in-law with a “you must be joking, he doesn’t stand a cat’s hell’s chance of even getting on the ballot” response. However, like the response to ‘the man who stepped up to the piano and actually started to play’, when I read Corbyn’s manifesto I could find little that I disagreed with. When I factored in his independence from Westminster politics and his ever-increasing local popularity, I realised that he offered a chink of light worth going for. Twenty-four hours later I was a signed-up member of The Labour Party; and when he just managed to get the nomination of 35 MPs to get on the ballot, I was convinced that he had a very real chance. Last night I attended an excited rally for Corbyn and Abbott, (I will not be supporting her in her quest to be Mayor Of London), in an over-flowing Bloomsbury Central Baptist Hall. The audience was a mixture of 21st century youth and 20th century socialist ‘older folk’. The latter must have been delighted by being addressed as ‘comrades’ by some of the speakers, (but not, thankfully, by Corbyn or Abbott), but I do most sincerely believe that such leftist anachronisms will fall by the wayside as Corbyn, of necessity, forges a broad-left coalition once in power. I can not guarantee this but it is my hope. (I also can’t guarantee that he won’t split the party.) And this is my main point: don’t fall into the trap of statically judging Corbyn by where he seems to have come from. Think about the dynamic possibilities of having an opposition led by a political leader who has a Teflon-coated track record of not being dragged down by the Westminster cabal, is a man of principle and puts forward policies that you might actually support. Think about it. * For a much more erudite exposition on why Jeremy Corbyn may be just be better than sliced bread, click here.